Welby Gardens is not accepting new fundraisers/plant sale customers at this time. Hardy Boy Plant shared a post. 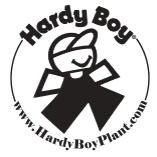 Hardy Boy Plant travels the country every year visiting trial gardens looking for new and trendy flowers to grow for you.